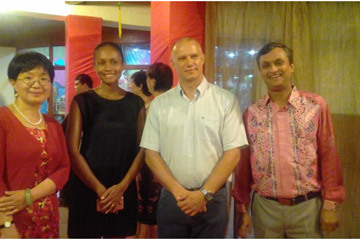 Berjaya Beau Vallon Bay Resort & Casino hosted an elegant Chinese gala dinner as part of celebrations locally to mark the Year of the Dog and to celebrate the strong relations between the Seychelles and China. The event brought together the local Seychelles Chinese community as a true reunion for the friends of China. The evening was attended by the Chinese Ambassador to Seychelles, H.E Yu Jinsong and Minister of Health, Jean Paul Adam. The Chinese community in Seychelles was also well represented, bringing the right flair to the event and helping to make it a big success. Guests were treated to a live band and also enjoyed a sumptuous Chinese dinner, which included crispy Chicken Wanton, Roasted Duck with Orange Sauce and assorted Chinese cookies. 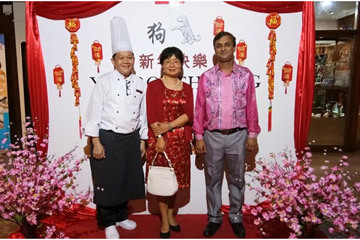 Caption: The evening was attended by the Chinese Ambassador to Seychelles, H.E Yu Jinsong (left) and Minister of Health, Jean Paul Adam with his wife, accompanied by BBVR GM Pravir Mishra. Caption: A candid moment with the Chinese Ambassador to Seychelles, H.E Yu Jinsong, accompanied by GM Pravir Mishra and Executive Sous Chef, Chef Law Heng Juan.